The BLASTIC project had the honour to give a presentation during the Our Ocean conference in Malta the 4-5th October. It was me and my colleague Joakim Brodahl who represented The BLASTIC project at this European Union-hosted conference. It was exciting to be a part of this conference, among all decision makers and royalties from around the globe. Together we all share a love for our oceans. Our session went well and we had a dedicated audience who asked questions and had comments regarding marine litter. It felt good to know that we are not alone in our work to combat litter in the Baltic sea. If we don’t act today we will face even greater problems in the future, that is a fact. But I still like to emphasize that marine litter is already a problem and we have to find solutions. It’s not only a threat for the coming generations. We cannot wait for political decisions, rules or laws to be implemented. We must act NOW! One person that really acts now is Afroz Shah. From my perspective he was one of the most inspiring speakers at the summit. Afroz Shah is a lawyer who in his home country Mumbai operates the largest beach cleaning project in the world. They have collected more than 4000 tons of trash on Mumbai’s Versova Beach. He said that “Efforts must start individually” and pointed out that beach cleaning is not only about cleaning, it is also about changing attitudes. -The actor Adrian Grenier, founder of Lonely Whale foundation, got the crowd to raise and promise to stop using disposable straws. –The Prince of Wales stated in his speech that we eat plastics. –Sylvia Earle, founder of Mission Blue, began her speech with a message from all the millions of creatures in ocean, why do we humans call this conference” Our Ocean”? “I think they think it´s a little presumptuous”, Sylvia said. Perhaps of today we are facing the worst marine litter period in human history. With joint efforts, with fulfilment of all promises given before and on this conference, my feeling is that we have the will and common grounds in place for changing the course. It is too late to clean our seas, but we can stop the littering sources and pathways to the sea. And that is exactly what BLASTIC is about. That’s why our agenda, work and results is truly needed in this time age. We need to plug the marine litter tap. 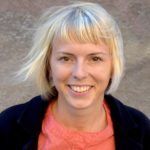 Ida Holmberg is working as a communication officer at Keep Sweden Tidy. Ida has a BA in communications and has worked with communication and marketing issues in the last 10 years. At Keep Sweden Tidy Ida is working with projects relating to school and pre-schools, nature and sea.